Get this - you can get the entire Printmaker System (Swift Galleries, the Path to Printmaker course, and the Printmaker Coalition coaching group) for FREE. Foh frizzle. For realz. But really, yeah, free. 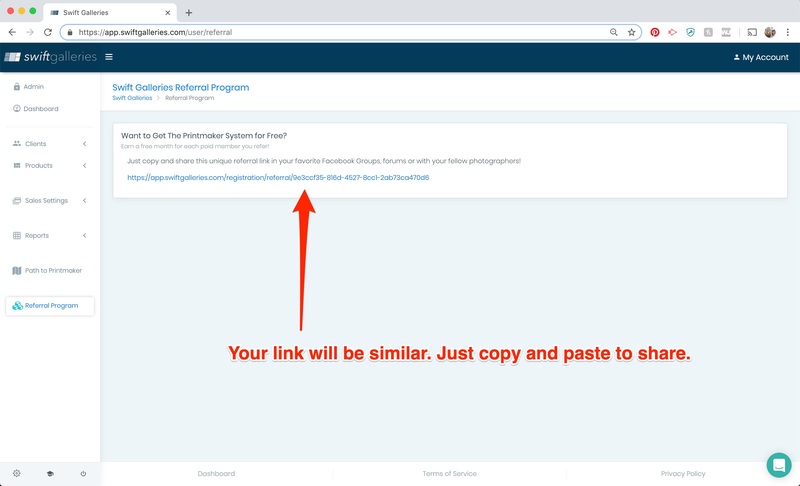 All you need to do is share your unique referral link that's prebuilt for you. When someone signs up, our system documents it. You get a free month for their sign up. For each person. So if you get just one person every month to sign up for a whole year, you've got 12 referrals. That means 12 months free. Here's where you'll find your link. Don't use the link above. Use your own link. On your own page. Because each person has a unique link. Just copy and paste this link when you share. If you want it to be pretty you could go through something like bit.ly to have a shortened URL. Post designs you've made in Swift Galleries on social media, photography Facebook groups, etc. When someone asks how you did it, either reply with "The Printmaker System by Swift Galleries, they're awesome, here's my referral code: XXXXX." Or say "The Printmaker System by Swift Galleries. It's my favorite thing ever in life, even better than my robot vacuum. I'll send you my referral link in a private message/email." But don't say that thing about the robot vacuum because then you'll be lying. Because robot vacuum. 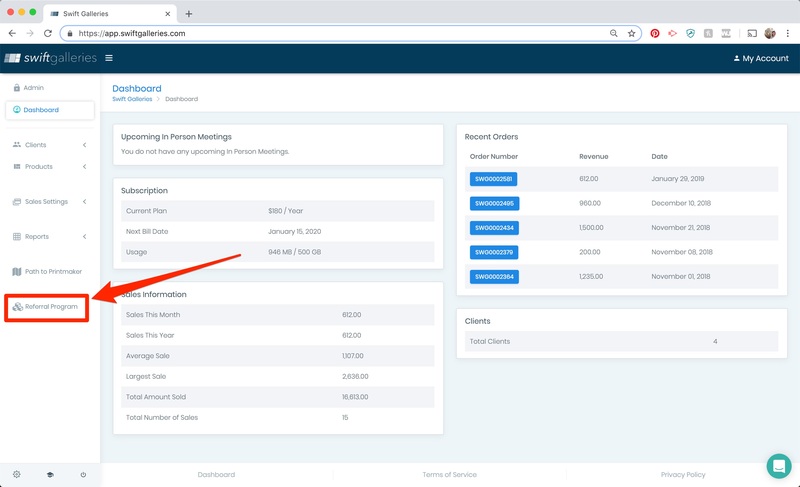 When someone asks for something like a sales meeting checklist, or blog post ideas for how to set expectations for selling physical products, or a planning meeting checklist, or how to do virtual or remote in-person sales for out of town clients, tell them it's in the Path to Printmaker, and send them the referral link. Have a "For Photographers" section on your website. A little hint here, having resources for your own industry makes you look like you REALLY know what you're doing. So potential/current clients will see you as an authority figure in your industry, which gives you brownie points and bumps you up the list of photographers they're thinking of booking. You're welcome for that little nugget there. Are there any caveats? Any fine print? Yes, there are. The photographer you refer has to have a current paid subscription for over 30 days, since we have a 30-day refund period. Second, you get a credit for a month at whatever your subscription is, you don't get a payment credit into your account for the amount the new photographer pays per month. So if you're in our $180 per year subscription, each referral gives you a $15 credit. If you're at $24 per month, each referral gives you a $24 credit. You literally get a one month credit. How does this actually work? Do you send me a check? No. What actually happens is you get a dollar amount credit into your account, which is directly connected to your Printmaker System (aka Swift Galleries) subscription. The next time you have a subscription payment due, we take any credit in your account first, and charge your card on file for the rest. Now, go share away! Thanks for continuing to make The Printmaker System by Swift Galleries full of the best, kindest photographers we've had the joy of meeting and working with.